St Leonards (NSW 2065) is not generally my preferred destination for an evening out. Its reputation stands as a transport, medical and small business hub, with buildings of the 70s light industrial-type. Yes it’s easily accessed and a busy thoroughfare during the day, but by night, it’s pretty soulless and bleak. Not much speaks to character, culture or cool, or places to bring people together, to pause and partake: there’s a pokie-filled pub (no thanks), a few eateries and a couple of new gleaming residential apartment buildings on the periphery and that’s about it. Neighbouring Crows Nest seems to have snagged all the hospitality options. For many it is far too deep into the territory known (and not so affectionately) as the ‘dark side’ – of the Bridge that is. Let me say, this is changing. 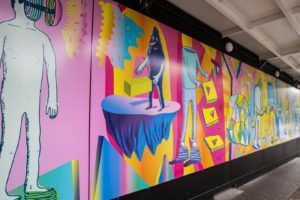 I ventured into St Leonards for a night out recently, to the TWT Creative Precinct Block Party, its 5th annual party and Art Month Sydney 2018’s closing celebration. I’d been to a couple of exhibition openings in the vicinity previously but hadn’t understood the gallery spaces to be within a bigger cultural community. I was really curious as to what I’d find and who I’d see, and I was pleasantly surprised. 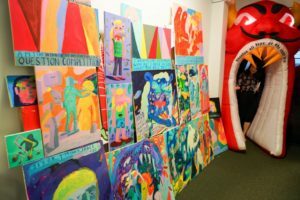 What I found was more than a notional one-off event dedicated to local amateur artists, but a deliberate and long-term plan to support and promote artists and small creative businesses, embedding them in the area, embracing the local community and enticing others to visit. The strategy for the block has a name: TWT Creative Precinct. 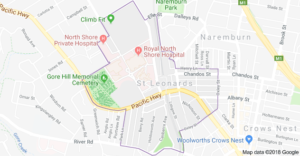 The block – between Atchison and Chandos Streets in St Leonards – comprises 18 buildings with over 4,500sqms dedicated to 70+ artists and community groups working across visual and performing arts; music, film and photography; food, homewares and bicycles. 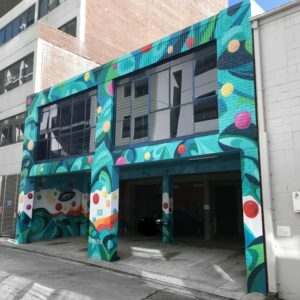 TWT is the international property group which owns most of this block and, since 2014, has worked closely with the not-for-profit arts organisation Brand X, and now its own arts-dedicated team, to activate largely empty commercial buildings and develop long term options for creative industries. Surry Hills, Newtown, Marrickville, Darlinghurst need no longer have the cultural monopoly over this city. 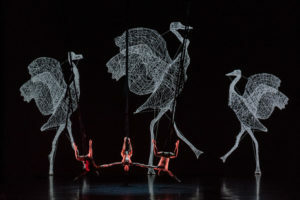 With strategic development, some serious money and enthusiasm from artists, the Lower North Shore will become a serious contender. Brand X has solid experience working with government and business to re-purpose under-utilised urban spaces into cultural places, to create opportunities for artists to work, and to promote the arts as central to a vibrant and engaged community. 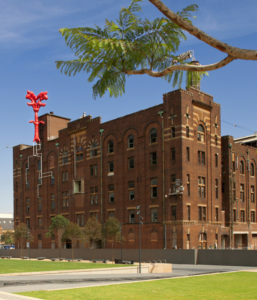 In 2008 it formed a partnership with Frasers Property to transform the vacant warehouse space on the old Kent Brewery development site at Broadway into a multi-disciplinary art space; and again, in partnership with Frasers and Sekisui House, on the creative development of the shopping mall on a nearby site, also on Broadway. 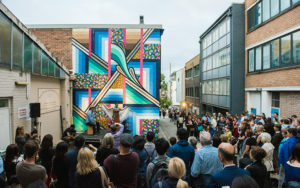 Though both sites have since been returned to the developer for private/ commercial use, as venues for artists and art activities (and together with the game-changing cultural landmark nearby, White Rabbit) they had a strong and lasting impact on the local cityscape and vibrancy of the general neighbourhood. That part of town has changed dramatically. Caroline Rothwell Symbiosis 2012. Installation view Chippendale. Frasers Property Group. 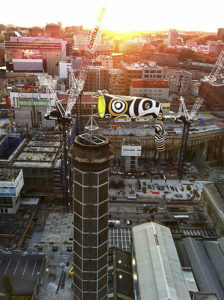 Image courtesy the artist. It remains difficult though to get this message across to the powers-that-be, both government and private interests: that communities thrive, both economically and socially, when culture and creative industries can become integral to all points in daily life. Be it the small creative industries working at the local level –the artisanal sourdough from the funky little café on the corner, an architecture practice or a local designer fashion store – or the less visible but no less important, independent writers, dancers, artists, designers, electro-punk musicians and producers etc. Invariably their irregular and low incomes do not match those of, say, the traditional “suits” of this town, so finding ways to keep them close, within our communities, working and contributing, is an urban planning issue which must be addressed. Artists are no different from the rest of us running small businesses. They seek a stable, affordable, secure space. Ideally the studio space will complement the nature of their practice – big if they paint big; sprung floors if they dance; natural light or darkened windows – will allow for the experimentation and sharing of ideas, practices and equipment. Did I mention affordability? 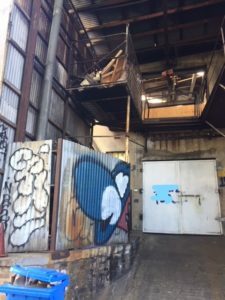 Invariably artists have to be flexible and adventurous, often venturing to areas and into buildings which no one else will have. They have to be resourceful and sensible and take on OH&S principles. Most rent, few own. Most landlords of under-utilised buildings are rarely willing to commit further resources to fit them out to make them safe, private, protected from the elements, with “luxuries” like power, wifi and plumbing. TWT has large-scale developments for Sydney in the pipeline. 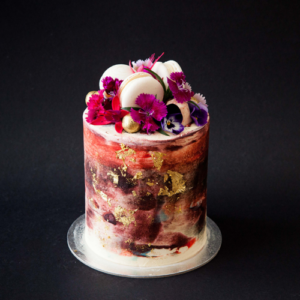 Their point of difference is their belief, as a commercial enterprise, that it makes good business sense to support artists in real ways which encourage their ability to work. TWT states its approach is ‘curating communities’, developing environments which allow residents, artists and visitors to thrive. UNSW Art+Design Graduating artist Jessica Long was awarded the 2017 TWT Excellence Prize, which includes a $2,000 bursary, for this video work: Apartment Block no 10. 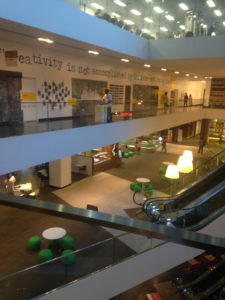 Image courtesy the artist and UNSW Art+Design. TWT has also established a charitable foundation The Bridging Hope Charity Foundation (BHCF) here in Australia. 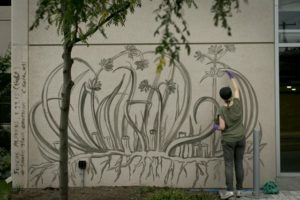 BHCF’s mission is aligned with the principles of TWT – it too is a Major Foundation supporter of the Biennale – but its focus extends more into mental health issues, as it strives to connect friends, families, colleagues, artists and mental health professionals to provide opportunities for our community, to live in a culturally vibrant and healthy society. BHCF has partnered with Lifeline to develop a culturally appropriate crisis support service for Chinese communities in Australia. Back to my big night out. In one night I came across Tara Marynowsky, who was preparing for her solo show at ChalkHorse Gallery. 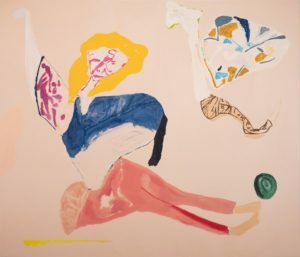 I chatted with Todd Fuller about his practice, particularly the recent work I’d seen at May Space and glimpsed new work-in-progress. Neil McCann aka Captain Pipe led me through a display of his work. 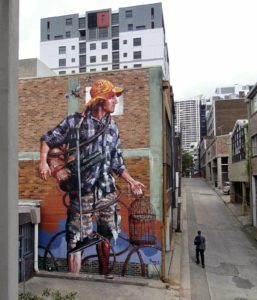 I recognised his style from Site Works project of the City of Sydney which commissioned a collection of original, contemporary Australian artworks licensed for use on construction sites across the city. Caotain Pipe Real Myth, painted hoarding, 71-79 Macquarie St Sydney CBD. Photo Katje Ford. Image courtesy the artist. Big tick for the City of Sydney, which has an extensive arts focussed strategy and with this hoardings project, transforming the visual impact of the endless construction sites around the city. Captain Pipe and William Mansfield. 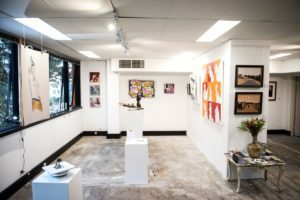 Installation view TWT Creative Precinct. 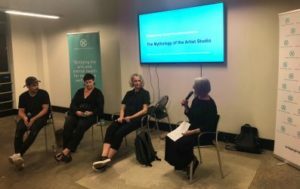 The list of impressive artists goes on: Oliver Watts, Caroline Rothwell and Abdul Abdullah have studios there; Tom Polo and Joan Ross, no stranger to the North Shore since she won the Inaugural Ravenswood Women’s Art Prize last year, is soon to move in. 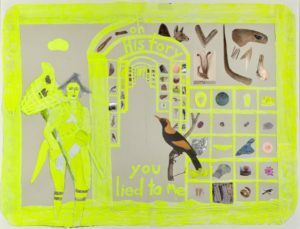 Joan Ross Oh history, you lied to me, 2017 mixed media on paper. 95x122cm. Winner 2017 Sulman Prize, AGNSW. Image courtesy the artist and Michael Reid Sydney. Stalker Theatre, Dot and the Kangaroo installation view. Image courtesy Stalker Theatre. At Riverside Theatres, Parramatta 15-16 May 2018. There’s room for puppetry making, music and performance with Collective Sound Studios, a space of 6 private rooms to accommodate up to 9 musicians, who work in production, performance, song writing and tuition, at any given point in time. There is a purpose-designed space with mirrors, sprung floor, tarkett and dressing room, specifically for pre- and creative production rehearsal. Much needed in this town. Moon, Wonderfruit Festival, Thailand 2017. 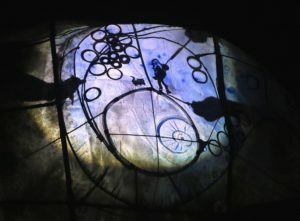 Large scale illuminated installation incorporating a shadow puppet show performed from inside the moon. Designed, built and performed by Aesha Henderson and Samantha Hickey. 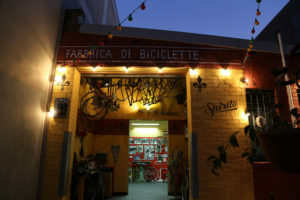 The list of tenants widens to include small businesses with a creative bent, which front the alleyway cutting through the Precinct and which, at the Block Party, were open and showing their wares: bespoke bicycles from Cicli Spirito, beautiful confectionery concoctions from Cakedown Bakery, photography studio Contact Sheet, as well as couple of galleries, Cre8tive and Me space. Cre8tive Gallery St Leonards. Installation view. Contact Sheet TWT Creative Precinct. 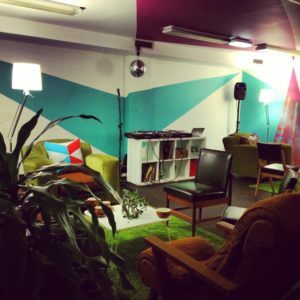 Co-working space. Image courtesy Contact Sheet. In addition, and what I think speaks to a real commitment to the local community, were the amateur printmakers in residence whom I chatted with about their practice, and the performances by ballet students of the Tanya Pearson Classical Coaching Academy which is ingrained in the local dance community. 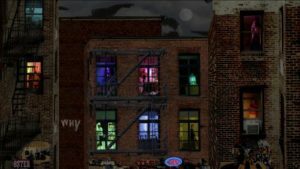 The Lonely Kids Club and Blue Guitar Project operate from the Precinct. Both are viable businesses, aimed at assisting disadvantaged kids through their fashion design and manufacture, and music tuition. Dance students, Tanya Pearson Classical Dance Academy. The activity continues beyond studio access: TWT/ BHCF has begun to host regular events, smaller and more focussed than something like the Block Party, which include artists and the arts community, to build awareness and credibility for what they are seeking to achieve. I think you get the picture …..
Artists driving effective urban renewal is not new. 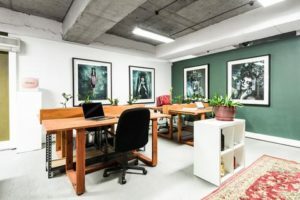 Sometimes it is a gradual organic process: artists/ creatives establish an enviable lifestyle in a neighbourhood, attracting the next gen of property owners. Richard Florida spoke to this model as a viable way to revitalise down and out precincts. The upside is improved property values and community amenities; the downside is the artists/ creatives are forced out because they can no longer afford to live there (hence the reference to Florida as the Patron Saint of Smashed Avocado*). *cheekily beatified by Oliver Wainwright, The Guardian, thank you. Other times it is a more focussed, deliberate approach. 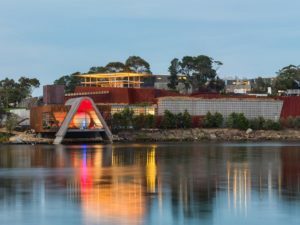 Think MONA in Hobart and the impact of this spectacular cultural infrastructure at all levels of the local community and landscape, which many State Governments have been unable to achieve over decades. 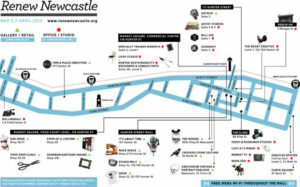 There is also the Renew Movement in Newcastle – again an initiative of an individual rather than Government, to lend vacant properties in abandoned, depressed neighbourhoods to artists, to stimulate the potential for re-establishing commercial businesses. TWT’s is another model: one which enables artists to live, work, rehearse, perform and exhibit in the current buildings but then to stay on, once the glam development is complete. The principle is inclusive, embedding different layers within the development which encourage artists to remain – to bring their heady, exotic and vibrant mix to what may become otherwise yet another homogenous, suburban high-rise. It’s a strategy which recognises the financial benefits and communal sustainability of ensuring contemporary culture, in all its forms, is not separate from how and where we live, but is an integral part of the activities, people and structures of our neighbourhoods. It’s about creating interesting, engaged and diverse communities. May the talk hold true. Watch this space!